The Hattie B. Cooper Community Center has served as an anchor and engine for leadership development, especially among women of color in Roxbury, for over 100 years. 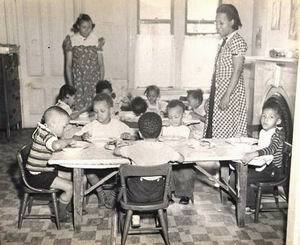 In 1916, the Hattie B Cooper Center opened its doors to 69 children at the Fourth Methodist Church on Shawmut Avenue. 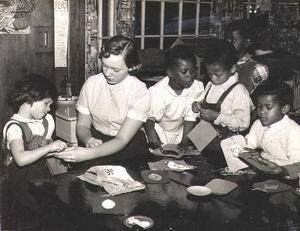 Cooper was started thanks to the energy and enthusiasm of Mrs. Edith Scott a social worker and the wife of the Rev. Albert Scott, and Hattie B. Cooper, the first chairperson of the Women’s Home Missionary Society of the Methodist Episcopal Church. The women noticed a need in the community to educate the youth and keep them safe, the same issues that Cooper addresses today. Since that time, Cooper has continued to serve the community, operating out of locations on William Street and Shawmut Street, and finally, in 1976, out of its present site at 1891 Washington Street. While Cooper has occupied several locations since it’s creation, Cooper preserves the original intent of our founders by offering services for families of need in what remains one of Boston’s poorest communities. Cooper currently provides high-quality early education and care to 111 children daily through it’s Infant and Toddler program, Preschool, and After school program. Cooper also offers community computer classes and public access hours at its Timothy Smith Computer Center, and a summer camp for 39 children. Cooper is dedicated to ensuring children and their families are provided a safe, educational facility that will facilitate in their growth and development; creating the foundation for future successes. Cooper has an enormously rich history of generations of service, and its graduates can be found everywhere in the greater Boston area, as officials in State and Municipal Government agencies, as local business leaders, and as committed members of the community. The children of Cooper today are the leaders of tomorrow!